Dubai is one of the leading three property destinations for Indian investors to buy property abroad. It’s stable economic growth, great returns, tax-free environment, lower prices and safe haven status are some of the key triggers which make the place an attractive investment destination. Many Indians make Dubai their base for carrying out business with Middle East and Wider Europe. The profits made on resale of properties or by renting those out in Dubai are really considerable. The Dubai property market offers everything- affordable houses, mid –segment apartments, premium apartments to high-end luxury villas making it an ideal destination for an investor’s delight. It is a hot favorite investment destination for international investors and specifically the Indians, who have pumped a total of Rs 1,24,440 crore ($18.3 billion) into Dubai realty since 2011. Investors here have the benefit of zero lock-in periods with no property tax or capital-gains tax. It is an appealing platform to cater to the investment needs of many. 1. It has fairly simple and straight-forward government policies which lead to a hassle-free process of purchasing a property. Property purchase over here is comparatively simple and does not require any lengthy paperwork, etc. 2. Touted to be a safe, peaceful and modern city-state, Dubai attracts several international investors who prefer a viable and profitable environment for parking their hard-earned money. It offers an investor-friendly environment as it remains least affected by the market turbulences unlike other parts of the world. It is a rapidly flourishing economy that has a huge influx of tourists from every nook and corner of the world. 3. Dubai is the fourth most visited city and a top-class tourist destination. The booming tourism sector also acts a catalyst in fuelling the growth of real estate in the city across all realty segments. 4. Quality tourist experience and a steady market make the place the most desirable real estate destination and promises huge returns on investments attracting an appreciable amount of international investors. Since the city-state is very close to Asia and has property prices lower than other primes destinations of the world, it acts as a major advantage for the people in China and India to make money from renting out property in Dubai. 5. Proximity to India is another major reason as 40% of the city’s population comprises of Indians only. The Indian investors feel Dubai is a home away from home and are at ease while investing property there. Hassle-free visa availability and frequent and short flights from most Indian airports makes the city easily accessible for recreational and business purposes. Hence, thousands of professional developers are eying the place for launching their pristine projects. 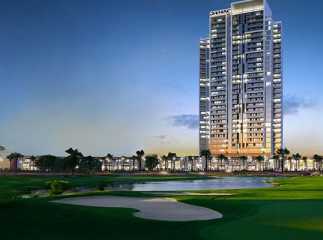 One of the outstanding properties in Dubai is Damac Carson Akoya By.